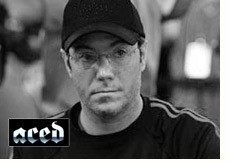 Jamie Gold, 2006 World Series of Poker champion, has apparently signed a sponsorship deal with Aced.com. Aced.com is a relatively new room that is a part of the Merge Gaming Network. According to Pokerscout.com, Merge Gaming is the 19th largest online poker network in the world. Jamie Gold will apparently be the "face" of Aced.com going forward. Jamie Gold rose to prominence when he completely dominated the 2006 World Series of Poker, and ended up taking down the first place prize of $12 million dollars. Since then, Gold hasn't had too much success - his biggest cash was a 35th place finish at the 2007 World Series of Poker Europe main event for $54,673. Gold has basically dropped off the face of the earth lately, and is regularly seen playing mid-stakes cash games in various casinos around the United States. Many people have speculated that Jamie Gold has blown his bankroll in recent years. They cite the fact that Gold has been largely absent from the tournament circuit over the past year. Gold certainly seems to be an odd choice to sign to a sponsorship deal. However, given the fact that practically every well-known poker player in the world is already inked to a sponsorship deal, Jamie Gold was probably one of the few "big" names left to sign. Would you play on a site because Jamie Gold was playing there?